Ed Brisson and Matthew Rosenberg talk touring and tease Uncanny X-Men #2 – AiPT! 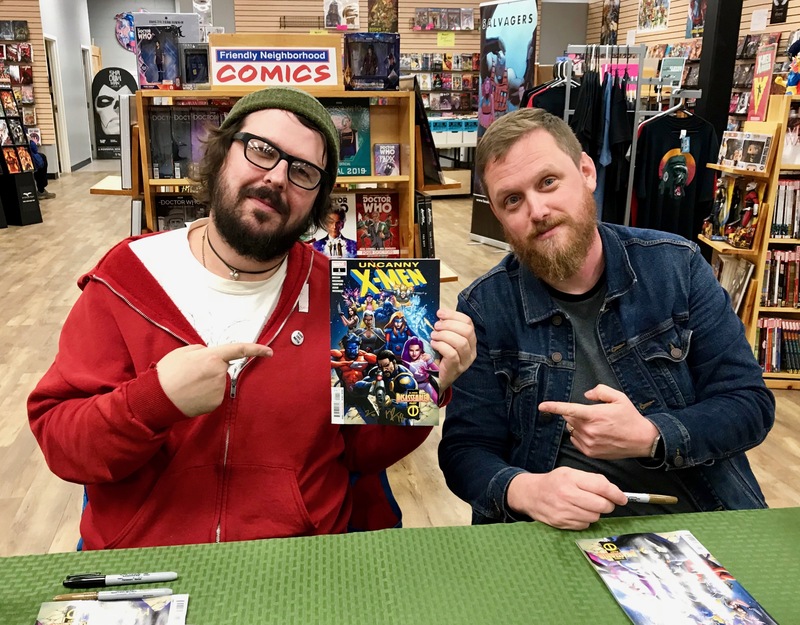 A quick chat with Uncanny X-Men co-writers Ed Brisson and Matthew Rosenberg at Friendly Neighborhood Comics in Bellingham, MA. Since their debut in 1963, the X-Men have sworn to protect a world that hates and fears them, but here at AiPT! we’ve got nothing but love for Marvel’s mighty mutants! To celebrate the long-awaited return of Uncanny X-Men, AiPT! brings you UNCANNY X-MONTH: 30 days of original X-Men content. Hope you survive the experience… I had a chance to meet and interview writer Matthew Rosenberg this past August at FAN EXPO Boston 2018 on the same day Marvel Comics announced he’d be co-writing the relaunched Uncanny X-Men alongside Ed Brisson and Kelly Thompson. It seems Rosenberg is always in Massachusetts when there’s an Uncanny milestone, as the writer was in the Bay State on the day Uncanny X-Men #1 hit comic shop shelves. And, he brought Brisson along for the ride! The final stop on day one of the writers’ release week signing tour brought them to Friendly Neighborhood Comics in Bellingham, MA. It’s inside this spacious comic shop that I had a chance to catch up with the X-writers, talk about their tour and find out what readers can expect from the next issue of Uncanny X-Men. AiPT! : So, how did the idea for this tour come about? Matthew Rosenberg: Uhhh… [Laughs] Well, the book was coming out and it’s the biggest thing either Ed or I have ever done, so we were pretty excited. It’s just something we talked about a lot. We’ve been friends for a long time. Ed was coming down to New York to help promote the book and I was like, let’s extend it and do some more shops. And I know he loves a road trip, and I love a road trip. Ed Brisson: Yeah. And originally, let’s do three days of five stores. And now, I think we’re up to five days and fifteen stores. Rosenberg: Five days and fifteen stores, yeah. Brisson: But it’s all good, it’s all good. Like Matt said, I love a road trip – getting to hit a lot of states I’ve never been to before. Rosenberg: How many states you been to, Ed? Brisson: I don’t know, I haven’t sat down and counted. AiPT! : You live in Canada, right? Brisson: I live in Canada, up in Halifax. AiPT! : This is the last stop on day one, so what’s been the best part of the tour so far? Brisson: It’s really just getting out there and meeting people on the day the book comes out, and I saw the book physically for the first time at our first signing, which was kind of cool as well. Rosenberg: Yeah, people are really excited. It’s the X-Men and it’s something we’ve been really excited about for eight months. Brisson: Almost 10 months, I think, since we started–when we were first approached. AiPT! : We first talked about it in Boston, in the summertime. Rosenberg: Yeah, and we’ve already written a whole bunch of it, so yeah, it’s fun to finally see it in the world. We’ve been pregnant with this book for a long time. AiPT! : Is there anything you’ve learned about each other today that you didn’t know before? Rosenberg: Ed cries while he drives, which is weird. Brisson: I don’t think it’s weird. Rosenberg: No, I don’t think so. We’ve known each other for so long and we came up doing cons together, so like, we’ve slept on a lot of the same hotel room floors. So this is not anything new for us–we’re not thrust together out of our elements, we’re kind of always doing stuff like this. AiPT! : If you could bring any of the X-Men on tour with you, who would you bring? Rosenberg: Wow. I was going to bring my Doop action figure. Brisson: Who’s a good driver? Which of the X-Men is the best driver? Rosenberg: Um, I would bring Magik so she could just teleport us, then we wouldn’t have to drive. Brisson: Yeah, that was going to be my go-to. Or like Nightcrawler so we could just do it in small increments. Rosenberg: You could take Pixie because she’s less crazy than Magik. Rosenberg: She’d be a little nicer maybe. AiPT! : Finally, what can you tease about the next issue of Uncanny X-Men? Brisson: Yeah, yeah… isn’t there a last-page reveal of who’s behind a lot of it? Rosenberg: Yeah, there’s a big moment next issue where you’re going to meet some people… some familiar faces in some new directions, maybe. Or maybe not familiar faces–I don’t know who you know. AiPT! : I’m looking forward to it. Thanks for taking the time to chat and good luck with the rest of the tour!